From dishwashers to dryer repair in Queen Creek, AZ, you can depend on us to provide you with quality appliance repairs in Queen Creek, AZ. Here Is Information About Repairs and Maintenance, Frequently Asked Questions, and Common Solutions To Appliance Problems. There are a few things you can look into fixing yourself before calling for washer repair in Gilbert and surrounding areas when having problems. This will save you time and money. As silly as they might sound, they happen often in our field of work. 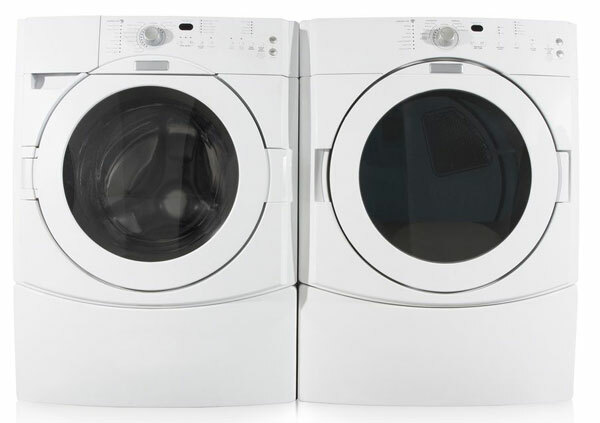 1 If your washer is totally non-responsive you might want to check if it's plugged in or might have blown a fuse in the fuse box inside your apartment or outside your house. 2 If your washer is leaking you will want to check the drain hose, making sure it's properly connected to the drain and does not have any cracks. 3 If your washer keeps filling up with water for a long period of time and never switches to the agitate cycle, you will need to check that the drain hose is placed at the right height. When installed too low or placed too deep into the drain there is a natural siphoning effect that occurs that does not allows the washer to fill to the appropriate amount before switching to the next cycle. 4 If your washer won't drain for TOP LOADS the problem is usually in either in the drain hose or drain pump. First look at the hose and make sure it doesn't have a kink. Next, check the pump. If you are unfamiliar with washers call us for your free quote (480) 440-7234. Feel free to talk to an expert about this repair don't hesitate to call. 5 If your washer won't drain for FRONT LOADS clean out the filter. When all else fails, and you need to have someone repair your washer in East Valley, call Leonard at (480) 440-7234 or click here to message our technician submit your request and we will contact you promptly to assist you with your appliance repair needs. Our customers are our greatest asset and your recommendation to your friends is your greatest compliment to us. We are more than happy to answer any questions about washer repairs that you might have, even for the "do-it-yourselfers". Whether you have a gas or electric dryer, there are a number of things that you can do to keep it running longer, better, safer and cheaper. Protecting your appliances with regular maintenance makes good sense. When a dryer has no heat call to schedule an appointment. Between the fuses, thermostats, heating elements and timers an accurate diagnoses saves you time and money. We guarantee 100% satisfaction or your money back. See us in action (480) 440-7234. Separate items by weight. Lighter items and many synthetics need less time to dry. By separating items, you can maximize efficiency of your dryer while cutting down on unnecessary wear on the dryer. Avoid overloading your dryer. Running a huge drying load makes the dryer work harder and less efficiently. Clean the lint filter on your dryer after each use. This will maintain good air flow, which helps dry clothes faster. Clean your dryer's exhaust duct annually. Keeping the dryer's exhaust duct free of lint will reduce the number of clogs. It will also keep you safer. Clogged dryer ducts are a fire hazard, so keep them clear. Use your dryer efficiently. If you have a number of loads to do, don't fold a load by pulling items out of the dryer one at a time. Instead, pull an entire load out and reload with wet clothes while the dryer is still hot. Fold the freshly dried clothes while the new load is drying. This will keep the dryer from cooling down between loads and having to come back up to temperature. Changing your routine slightly will extend the life of the dryer and save on energy. Use only the drying power you need. Don't set the dryer for 70 minutes when 50 minutes will do the job. Do some creative observation to see how long it really takes to dry your clothes. Once you have a good idea, choose a more precise dryer setting for each load. Consider using a clothesline instead of your dryer. When drying large items like bedspreads, comforters and area rugs, use a clothesline for the bulk of the drying. When the items are almost dry, use the dryer to fluff and soften them for a few minutes before folding. When your refrigerator just isn’t like cooling like it should, contact A to Z before buying a new one. The most common reasons for this condition in a refrigerator are, the evaporator fan, condenser fan motor, start relay, temperature control thermostat, thermistor, compressors, and the different control boards. An accurate diagnosis is essential, saves you money and time, don't hesitate, click to schedule an appointment today. We have a money back guarantee, and warranty all our work, and parts. Some of the frequent problems of ice makers include, the freezing temperature in the freezer has to be below 10 degrees, the water inlet valve, water filter, water pressure, the door switch or icemaker switch, and the ice maker assembly. Send in your appliance informationtoday and we can help resolve any issues with you icemaker. This problem could be a symptom of a bad temperature control thermostat, thermistor, damper, or one of the control boards. Leonard is an expert at find out exactly what is wrong. We accept Visa, Master Card, American Express, Discover, Checks and Cash so paying for a repair is easy too. Refrigerators are the work horses of major appliance. They work continually, efficiently, and usually we take no notice of our refrigerators. Refrigerators offer no easy clues as to what is wrong; most of the time they die quietly. Seldom are the moving parts visible. When things go bad with your refrigerator, the frustration starts to mount as the temperature begins to rise. But the good news is they usually can be fixed before this problem get too stinky. Here are a few things that you can do to maintain and prolong the life of your Refrigerator and Freezer. To begin with, like most things, start with keeping it clean. The most important things to keep clean on your refrigerator are a little less obvious though, like your compressor coils, and evaporator fan clean. The coils in older refrigerators were in the back or bottom of the refrigerator, and open to collect a lot of dust and pet hair, yet today they are commonly contained and you never even see them. The evaporator fan is usually in the back and can accumulate dust, keeping this clean is a once a year project, that you can clean with a vacuum hose and brush attachment. Another area that is essential to keep clean is the door seals and where they contact the refrigerator. These areas can easily get sticky and grimy, and when you go to open your refrigerator it is sealed shut with gooey syrup. This is not only annoying, but has the potential to damage the door seals, by ripping the outside plastic and exposing the magnetic strip. Then as the problem continues the magnetic strip falls out and your refrigerator door doesn't seal shut, causing the air flow to mess up and cover your freezer in snow. The good news is that this all can be prevented by keeping the door seals and refrigerator clean. Clean with hot soapy water as often as necessary. If your door seals are messed up and not sealing we can replace those, and restore your refrigerator back to working wonderfully. Finally if your refrigerator doesn't have an automatic defrost, be sure not to let the frost in the freezer compartment build up to more then a quarter of an inch. For the exterior, clean with a sponge and hot soapy water, dry and shine. On the inside of many dishwashers, there's a filter near the bottom, or under the lower spray arm that needs to be cleaned twice a year. If you have this sort of filter, check your owner's manual to find out how to remove and clean it. If it has holes in it, replace it to protect the pump and motor seals from particles that may be in the dishwasher. Over time, the small holes in the spray arm(s) of your dishwasher may become clogged with bits of paper, toothpicks, glass, (and play ground gravel, true story), etc. Your dishwasher will do a better job of cleaning your dishes if you take a moment to clean out these small holes from time to time. Remove the spray arm and clean it by poking a piece of stiff wire through the holes. Then shake the spray arm to make sure nothing is inside such as watermelon seeds or any other seeds. Finally scrub any mineral deposits with white vinegar. One last hint, the cap holding the spray arm in place is commonly reverse-threaded, which means you should turn it clockwise to remove it. Be careful not to drop the nut or washer into the motor. A to Z Appliance Repair specializes in the repair of large home appliances, including stove repair. My oven won't heat up? For this problem the most common solutions include, and are not limited to, checking the igniter on gas ovens, the bake and broil elements, incoming oven power source, the oven control board, thermal fuse, lose wires, and oven thermostats. Leonard is an expert at fixing these problems and finding the right solution. It is what he does every day. Remember, if any of these parts fail your oven will not heat properly. Why not give us a call to find out all the details (480) 440-7234. We use OEM parts. (Original Equipment Manufacturer.) It means the parts are made directly by the manufacturer, not by a third party. The quality is consistent with manufactures standard. This protects your investment. Good parts make a good machine. We can trust these parts to be authorized and approved by the manufacturer. Protect your appliances with the right parts. Dryer stopped heating. Called A to Z based on the reviews and scheduled a visit with Leonard. He arrived promptly as scheduled. He diagnosed and explained the issue thoroughly. He ordered the replacement part and returned the following day to complete the repair. I was very pleased with my experience and will use A to Z again. Very prompt showed up on day I requested and had part the following Monday at time said. When the water dispenser on our refrigerator quit working, Leonard was great. He responded immediately to my request and was at the house within a couple of hours. The service fee is very reasonable and the overall cost was less than I had thought it was going to be. Very friendly, very professional. I would definitely hire again. 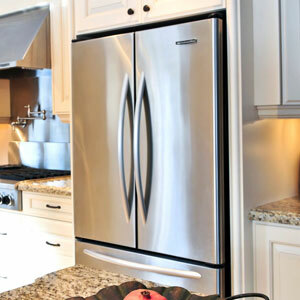 A To Z Appliance Repair is exactly the appliance repair you've been looking for. Leonard communicated before the appointment, gave a window of arrival, and was right on-time. He diagnosed the issue and repaired my GE Profile refrigerator within an hour. He had the part in-stock on his truck. Incredible service and professionalism. The price and value of his service and knowledge cannot be beat. I would highly recommend A To Z over any and all service repair I have used in the past 25yrs in the East Valley. Mind you, I'm new at this 'take 'em apart/put 'em back together' thing so I based my repair on YouTube videos... When a Leonard arrived (better than punctual! ), straight out he told me he'd just go ahead and install the parts just so he could be assured it was done properly (after all, we ARE dealing with parts that regulate the heat on the dryer..). So, shocked, I agreed - this would save me time and strife later! He installed everything in a flash, with me looking over his shoulder all the while so I could learn for any future needs. He was good spirited about me watching everything and asking questions, courteous and just a joy to have in the house for that very short period. I'm very, very happy with the whole experience and will highly recommend A-Z to anyone needing appliance repair, without hesitation! I had done the research and taken apart my dryer to fix the lack of heat, so I was looking for parts but wasn't sure if I ordered online, I'd get the right ones for my machine so I called A-Z and asked if they sold just the parts. Leonard offered to bring the correct, original kit of parts to me and was here within the hour. My washing machine started acting up this weekend and I quickly realized I wasn't going to be able to fix it myself. When I need to hire someone I look for quality, local, small businesses and I've found another one here. I found A to Z through a google search. I was able to learn that their service call prices were lower than everyone else's. I called Leonard's number from the website on Saturday the 5th of July. He answered and was then at my house within the time he gave me for that day. He fixed the problem quickly, was professional, and had great prices. If you are in St. Charles county and need help with any appliance repair, I highly recommend this company. They might work St. Louis county too, I am not sure, check their website. Thanks again Leonard! My washing machine is working like a charm now. I completed a repair request online on A to Z Appliance Repair's website. Leonard called me later that same day and told me he could be out the next business day. He was there when he said he would be. He had to order a part and was back out two days later, exactly when he told me he would be. The price was FAR below what I had been quoted from LG and it is working like new again. Hands down, the best appliance repair company I have ever dealt with. The fact that he called when he said he would and showed up when he was scheduled to come was a pleasant surprise. I cannot say enough about how professional and prompt he was and will definitely use them again in future. I recommend 100% A to Z Appliance Repair. Mr. Leonard knows his stuff and very professional. This guy is very genius. I am very happy with the job.